Follow this procedure to suspend and resume site protection as needed. 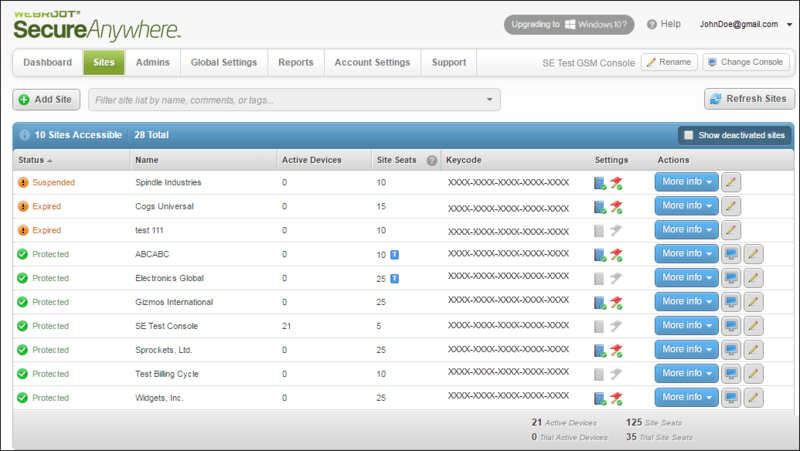 Access the GSM console at my.webrootanywhere.com. For the site that you would like to suspend, click the More info button. The More Information pane about that particular site displays. Click the Suspend Protection button to suspend protection for that site. The system suspends the site, and indicates this by displaying a Suspended icon in the upper left corner. Also, the Suspend button becomes the Resume Protection button. To resume protection for that site, click the Resume Protection button. Click the Deactivate this site button. The system deactiavtes the site. To view sites that are active as well as those that have been deactivated, in the upper right corner, select the Show deactivated sites checkbox. The system then lists sites that are active and also those that have been deactivated. 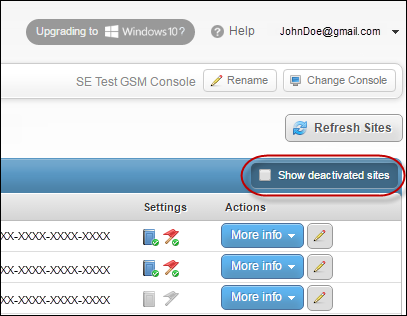 To view active sites only, in the upper right corner, deselect the Show deactivated sites checkbox. The system lists only sites that are active.